Water Daze swimmers churn up waves in Polson Bay Saturday afternoon. Nearly 80 people swam the mile-long course from the KwaTaqNuk Resort to Boettcher Park, with the fastest swim clocking in at 23 minutes, 27 seconds. POLSON — With blues skies and sun, 79 swimmers churned up the water in Polson Bay for the 10th annual Mission Valley Aquatics Water Daze on Aug. 4. 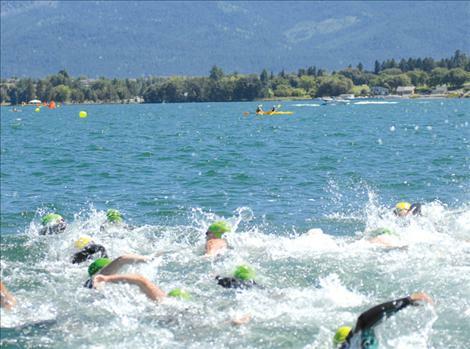 The 1-mile swim race began at the dock behind the KwaTaqNuk Resort and Casino and ended at Boettcher Park. “It was a great event even though the water was a little bit choppy. Everybody was happy to reach the other side,” said Tana Seeley, Mission Valley Aquatics project director. Seeley said each participant received a bag of Flathead cherries. Participants included people from all around Montana and even from the east coast and California. Fastest female was Jen Luebke, Missoula, at 26.23, Missoula; and fastest male was John Weston, Missoula, with a time of 23.27.